Be the first to share your favorite memory, photo or story of Flora . This memorial page is dedicated for family, friends and future generations to celebrate the life of their loved one. 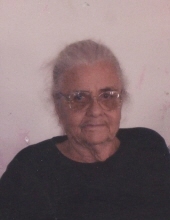 Flora “Sister” Jacobs of Rowland was born, Monday, July 19, 1926 in Robeson County, to the Late Giles Willie Jacobs and Bessie Rogers Jacobs as was born into eternity Friday January 25, 2019 at Woodhaven Nursing Facility in Lumberton NC, completing her journey of 92 years. In addition to her parents she was preceded in death by three siblings: Henry S. Jacobs, Sarah Catherine Oxendine and Rev. William Tracy Jacobs. Mrs. Jacobs was a loving Mother, Sister, and friend she was also a member of Benson Chapel Baptist Church. To send flowers or a remembrance gift to the family of Flora "Sister" Jacobs, please visit our Tribute Store. "Email Address" would like to share the life celebration of Flora "Sister" Jacobs. Click on the "link" to go to share a favorite memory or leave a condolence message for the family.